Things are going well at a new Crossfit gym that opened in Saratoga Springs on Sept. 1, according to co-owner Kevin Ostrander. The gym, called Crossfit 12866, is located at 30 Gick Road. It offers an extensive Olympic-style weightlifting program in addition to classes in Crossfit strength and conditioning exercises. Ostrander, with his wife, Lisa Ostrander and Dirk Duban, are partners in the Saratoga Springs facility and Lake George Crossfit in Queensbury, founded six years ago by Duban. The weightlifting program caters to people competing nationally, newcomers to weightlifting and people in between, said Ostrander. Crossfit 12866 is forming a team, along with the Saratoga Barbell Club, to train and compete in Olympic-style weightlifting. That is the style people watched during the Olympics in Rio de Janeiro last summer. It requires picking up the weight from the ground and lifting it overhead. Ostrander competes on the national level and also judges competitions. He expects to help judge an international weightlifting competition in Toronto. People can sign up for the weightlifting by itself or as part of a Crossfit program. He said the weightlifting program makes the Saratoga Springs facility “unique” among Crossfit gyms, but “Crossfit is the core of our business.” There are classes available seven days a week, from 5:30 a.m. to early evening during the week and on Saturday and Sunday mornings. 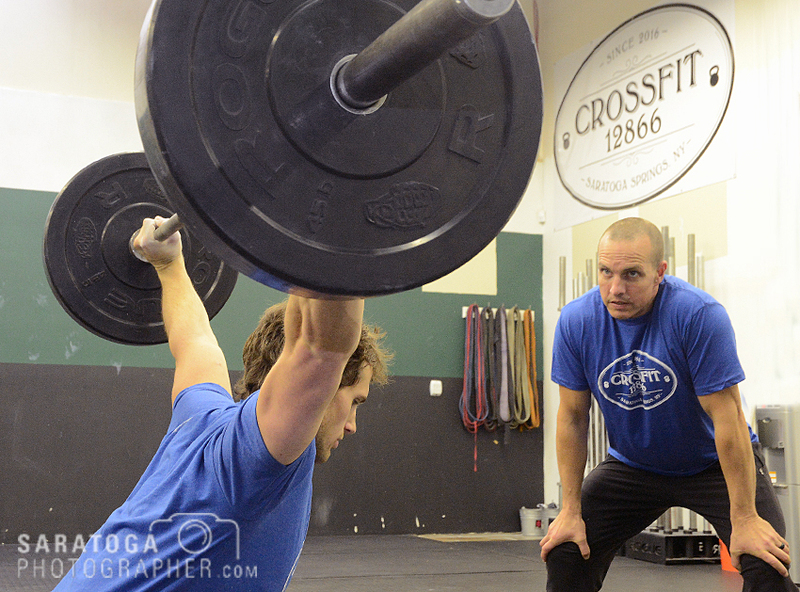 Exact hours are listed on the center’s website, Crossfit12866.com. In addition to classes, members can come in and work out on their own. Exercises are drawn from a number of disciplines, including gymnastics, weightlifting, kettle ball, running and biking. New members start with an introductory class and then a series of 12 classes called First 12 Days. After completing that series, they can sign up for different classes offered at the facility. Crossfit itself is not a franchise, but the facility is affiliated with a private company in California. The equipment comes from an Ohio company, Rogue Equipment. There are 12 coaches at the Saratoga Springs facility. Ostrander has been doing Crossfit for four years and has been an instructor and trainer for two and a half years. His partner Dirk Duban has been in the business for several years longer.